When Irene Dingwall started to suffer from a persistent cough, one of the first symptoms of lung cancer, she did not think of the dreaded disease. Just a light smoker for a few years in her youth, Irene felt she had no reason to worry about this particular form of cancer. But when doctors revealed she had a tumour in her left lung and her lymph nodes were badly affected she knew her health was in serious trouble. She said: "The scan showed there was a huge spread in all the lymph nodes and one was four centimetres big. "The consultant did not hold out much hope at all. "Anyone can find they have cancer, but those words were just devastating to me." Worried by her uncertain future Irene begged her husband not to send her to a hospice to die and asked her consultant to ensure that she did not choke as she was having severe difficulties swallowing. Irene decided to take all the medical options open to her and embarked on a course of surgery, chemotherapy and radiotherapy. But she wanted something more and decided to consult a healer and this she feels was definitely one of the turning points in her battle for health. "I went to see the healer and by the time I went for my chemotherapy four days later I was able to swallow. "He had an amazing gift, he was just wonderful. When I first went to see him I did not have huge expectations, I just felt I wanted to go. "I know there is no scientific basis for this, but this happened to me and I got better." After three cycles of chemotherapy she was told the cancer was receding. "The consultant could not believe it and said it was wonderful. It had regressed 50%. "Forty days after seeing the healer it had vanished, but I proceeded to have the rest of the chemotherapy." 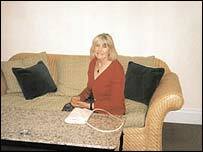 Her healer Dr Michael Seear, a qualified GP, said Irene had helped her own recovery with her indomitable spirit. "Irene was very gung-ho. She was adamant everything we did would be soaked up." But Dr Sears said that although this sort of healing worked for Irene that it could not cure everyone. For some patients with terminal cancer, healing is a way of helping them to ease their deaths. "Healing is not a panacea in terms of a cure. You can cure sometimes, but you can comfort all time." Irene, aged 64, then had radiotherapy. But she said that alongside the conventional and holistic therapy, Irene also took up a variety of sports to get fit, aqua aerobics, swimming and Pilates. "It makes me feel so much better. I feel good. I have gone back. I am having a lot of vitamins and I feel very well. November has been designated Lung Cancer Awareness month, and the public is being urged to recognise the symptoms and get medical help. Sally Lee, campaigns manager for Macmillan Cancer Relief, said early diagnosis was vital to survival rates. "Lung cancer affects over 100 people each day and is the UK's biggest cancer killer. Early diagnosis saves lives. and we are grateful to all those companies who are helping us to raise awareness of lung cancer and its symptoms."